Hundreds of people in Ivory Coast are reported to have been abducted from their homes since last month's disputed election, the UN says. The UN High Commissioner for Human Rights says some of the assailants wore military uniforms and there is evidence of "massive" human rights violations. More than 50 people have died in violence in recent days, she adds. On Saturday Mr Gbagbo demanded that all 10,000 foreign peacekeepers leave the country, saying UN and French troops were colluding with former rebels. UN Secretary General Ban Ki-moon rejected the call. In a statement issued on Sunday, UN High Commissioner for Human Rights Navi Pillay said UN officials in Ivory Coast had received hundreds of reports of people being abducted "from their homes, especially at night, by armed individuals in military uniform". She said the gunmen were "accompanied by elements of the Defence and Security Forces or militia groups". Some victims had later "been found dead in questionable circumstances", she added. The 50 deaths, the statement said, had occurred in the past three days. More than 200 people had also been also injured. On Thursday, at least 20 people were killed as Mr Ouattara's backers tried to march on the headquarters of state TV and clashed with troops loyal to Mr Gbagbo. The UN Security Council has warned that all sides will be held accountable under international law for any attacks against civilians. On Sunday the confrontation between the two sides spilled into France, the former colonial power. Clashes broke out as hundreds of pro-Gbagbo demonstrators and 100 Ouattara supporters gathered in central Paris. Two people were wounded, police say. Meanwhile, the UK government has urged British nationals to leave Ivory Coast unless they have pressing reasons to stay. The US and France have previously advised their citizens against travelling to the West African country. The UN, the US, former colonial power France, and the African Union have all called on Mr Gbagbo to stand down. French President Nicolas Sarkozy on Friday said he should quit by Sunday or face EU sanctions. But Mr Gbagbo says the 28 November election was rigged by rebels who still hold the north after the civil war in 2002-03. He was declared the winner by Ivory Coast's Constitutional Council after it annulled votes in parts of the north. Both Mr Gbagbo and Mr Ouattara have sworn themselves in as president. 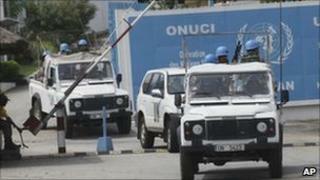 Mr Ouattara is currently under UN protection at a hotel in Abidjan.